Excavations at the Prison Hospital (Block 6) of the Johnson’s Island Civil War Military Prison site have been ongoing since March 28. 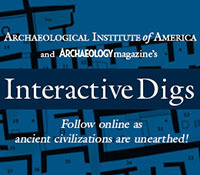 The Experiential Learning Program in Historic Archaeology through Heidelberg College has provided the student power that has resulted in the excavation of four 2 by 2 meter squares. Thus far we have had 17 classes working at the site, bringing just over 350 students to experience the Johnson’s Island Civil War Military Prison site. The four units (N184E136-142) have been excavated to just above subsoil, and at this point can only be completed by experienced staff. As we are exposing the subsoil of these units, we are looking for evidence of a possible drainage ditch around the outside of the block as well as postholes to support the building. These four units are along the southern wall of Block 6. We have begun to see a potential exterior drainage ditch here, but no evidence of the postholes to date. Our next report should have the results of this search. What we have found is much evidence of the use of the block for medical purposes. Of the materials recovered within the plow zone, the most diagnostic of medical use are the bottle fragments. We have recovered 16 pieces of embossed glass, most from either patent medicine or pharmaceutical bottles. Of particular interest is evidence of Hostetters Bitters bottles. Field Specimen number 6414 is an example of the Dr. J. Hostetters Stomach Bitters bottle fragment recovered. We have also recovered two examples of Adams and Fay (New York) patent medicine bottles. Over the years in our investigation we have recovered many examples of these bottles. We have yet to discover the history of Adams and Fay. Most recently, we have recovered two examples of USA HOSP. DEPT. bottles. Showing the site’s military association, we recovered one Union infantry officer’s button that may have been recycled and worn by a Confederate officer, probably as a sleeve button. 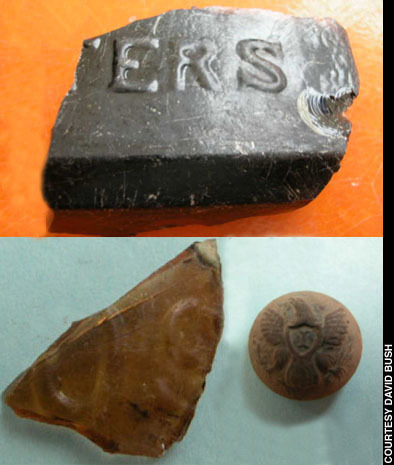 Also of interest are four pieces of a hard rubber smoking pipe. In our investigations of Block 4, we found a few pieces of hard rubber pipe, but that was in several years of investigations. Another pattern we are seeing is the lack of craft related items. We have discovered a couple pieces of cut shell and even one file, but overall, there is significantly less craft material being discovered in these Block 6 hospital units than was found in Block 4, where prisoners were housed. This is expected, given the nature of the use of this building. This is our report for April. We will be submitting another report in the next week or two, depending on our ability to expose the subsoil of the first units. Let us know what questions you may have. This entry was posted on Wednesday, April 26, 2006 at 12:03 pm	and is filed under Field Reports. You can follow any responses to this entry through the RSS 2.0 feed. Both comments and pings are currently closed.